and ready to go to approved forever homes! This litter should mature to about 12 lbs. Pet price means the buyer will have to sign a contract day of pick up or delivery to get the puppy neutered/spayed by the appropriate age. "Limited' AKC papers are extra. he should mature to about 12+ lbs. she should mature to about 12 + lbs. she is the smallest of the girls and should mature to about 11 lbs. she should mature to about 12 lbs. $250.00 deposit holds me for 1 week and is deducted from adoption price. I am ready to move to my forever approved home. Pet price means the buyer will have to sign a contract day of pick up or delivery to get the puppy neutered/spayed by the appropriate age. Limited AKC papers are extra. Don't wait! and end up being sorry you didn't put a deposit down. Please check back or Call for more details. We will have a few Females & a Male that are retiring or are not being used in our breeding program and will be available in 2018 for adoption. 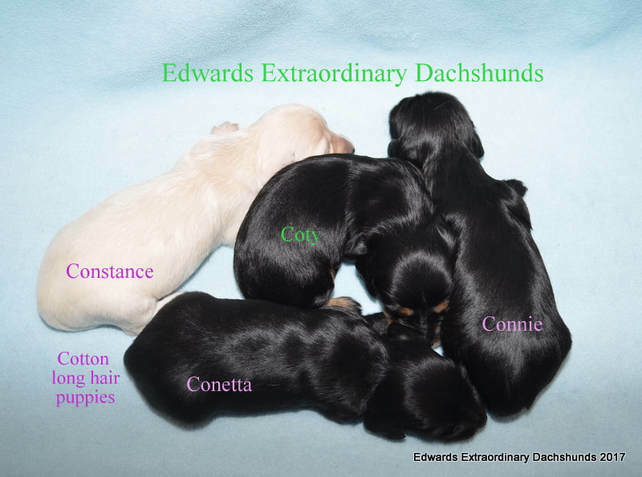 As you may have noticed from our Web site, we are very particular about the homes all of our Dachshunds go to. This, we believe, is something required of us as breeders and should be of any one who brings these wonderful animals into the world. Sometime our puppies stay with us a bit longer while we wait for the perfect forever homes for them to go to. The correct forever home means more to us then the age of the pup that is still here with us. Unfortunately there is an assumption by some that older puppies are somehow less valuable, less cute, or that they have issues. Sometimes timing is just the issue and a pup was not available when someone was looking and many more circumstances come into play. Let us tell you as people who are very experienced in the life stages of a puppy, older puppies are just as much fun and will not disappoint you, in opinion. There personalities are already pretty clear and evident, and they are through with their most frustrating puppy stages which make them typically easier to train. If they are older then 15 weeks they typically have had all their puppy shots, which saves you money . Some older dogs can be set in their ways but they are not un-trainable. Personality are often the issue rather than age. In our opinion, no dog is too old to train. In fact, in our experience, older puppies are easier to continue with there potty training than younger ones, as well as basic training - like, come, sit, stay and no. It's a common misconception that you need a very young puppy in order to quickly bond with and to instill proper basic training. Even thou AKC recommends potty training no earlier than 12 weeks, we start introducing them with pee pad training at 7 weeks old. And we start them with some basic training in socialization and quite time. A few our dogs have been purchased outside of their so-called " ideal puppy age " and we have found their transition to be significantly easier. So, please do not give in to the stereotype and overlook these older puppies ( what we call teenagers ) or Adults. A deposit holds a puppy until he or she is 8 weeks old or the date specified. If Not picked up by that pick up date they will be put back up for adoption and deposit will be forfeited unless prior arrangements are made in writing. We charge $5.00 a day to hold a puppy past the first pick up date scheduled or $35.oo a week. A deposit is "NOT" accepted to hold one of our pups until we receive in writing who the deposit is going toward, contact phone numbers, who pup is for, etc. Also a response to our email confirming to our pick up date, spay or neutering, etc. is required. We require "IN WRITING" who the deposit is going towards. All of our puppies are sold as pets. Which means they will be spayed or neutered at owners expense. 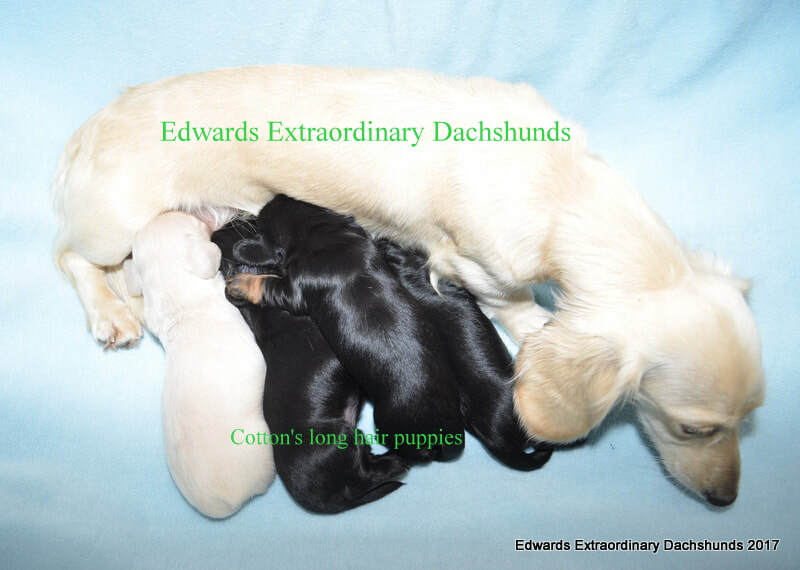 *AKC " bred" means the puppy comes from AKC Registered parents, and is a pure blooded dachshund. Deposit are NON refundable - Occasionally they are transferable to another litter within the month. We CAN NOT & DO NOT guarantee size of puppy at full grown. AKC puppies are all sold as pets. Limited Registration papers can be purchased at the time the puppy is purchased. AKC charges quite a bit, so in order to keep your cost down we DO NOT pay to register the AKC litters unless you pay the $100.00 at the time you buy your puppy to register your puppy limited AKC. And has to be discussed with us ahead of time. We " the Breeder " always reserve the right to have first pick of any and all litters we breed, unless otherwise stated.